Over the last few weeks, the Extension Store has had a few updates. Mostly just little tweaks on the frontend and performance improvements. But today I want to showcase two bigger updates. Sometimes it's useful to suggest the installation of another extension, that will play nicely with yours, or adds new functionality. For example, you made a theme with support for Disqus and Facebook comments. Now, if you define these package suggestions in your composer.json the Extension Store will pick it up for you, provided you press the extension's "Update" button on your profile page. "bolt/facebookcomments": "Add Facebook comments to your entries." After update, these suggestions will be displayed directly above the "Related" section on the extension's detail page. This feature is still work in progress, but it would be a shame to not let you play with it. 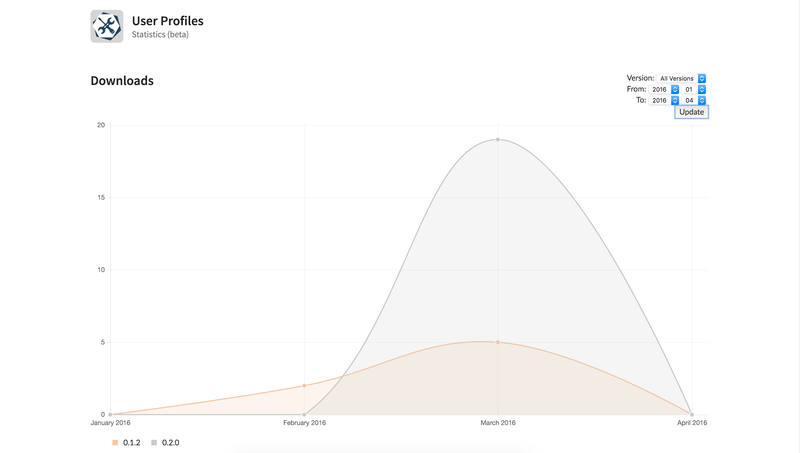 Today we deployed the first beta of the package statistics functionality, where an extension's owner can see the downloads for each of their packages grouped by month and version. The UI isn't finished yet, and grouping by days plus total download counts will follow, but for now it gives you a great insight about your extension downloads. You can find the link to the statistics page at the extension listing on your profile.